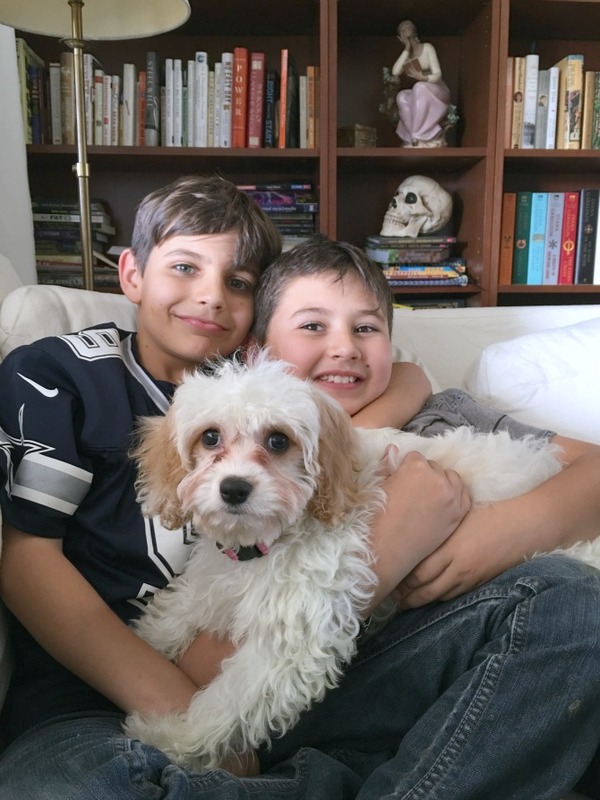 On Sunday we welcomed into our family a 7lb Ewok�we christened Magnolia Mae Jigglypuff Kendall. Maggie, for short.�Maggie isn’t the most original name for a female dog, but�I had it in my head that all our pets need flower names, like Buttercup. The boys vetoed Flora, Blanche, Daisy, Petunia, and a few others. She’s a 3.5 month cavachon and I can’t believe she’s ours. We weren’t looking for a dog, definitely not a puppy. 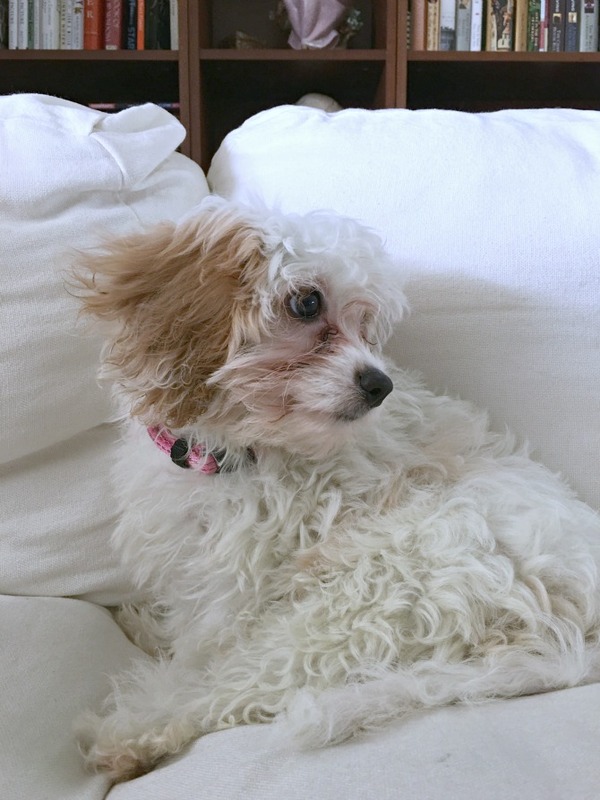 I said�a year�ago that I would only consider a female cavachon*, but we never really talked about it again. I feel like one of those women who didn’t know she was pregnant until she goes into labor. Miss Magnolia is so far fitting in nicely, though she has yet to meet Buttercup. We are getting back into the routine of having a puppy in the house again. Potty training, multiple feedings per day, and asking nicely that she please stop chewing the baseboard are now part of our day. Unlike Buddy and Buster, she seems quite taken with worn clothing. This morning I pulled out of her mouth one of Nico’s dirty socks. 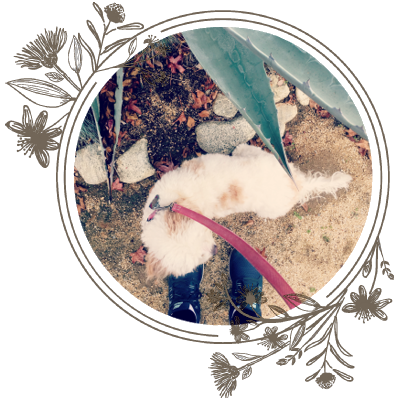 Not ten minutes later, she had my pajama pants in her mouth and was tearing down the hallway and into the family room, the legs�undulating behind her like�a floral Chinese parade dragon. It’s good to have a dog again. *I wanted a female dog only because I’m drowning in testosterone. 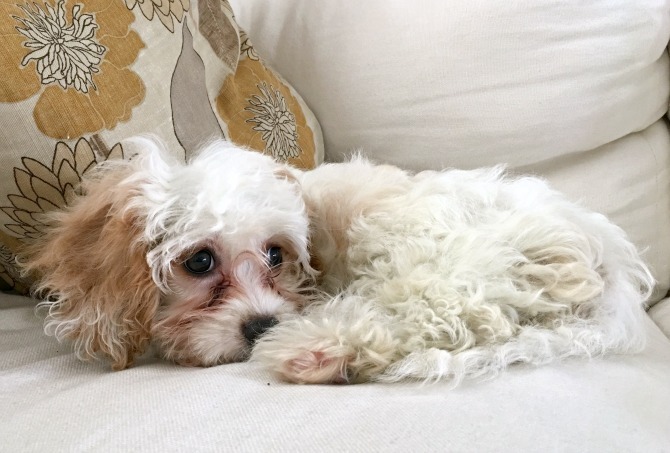 I wanted a cavachon because I heard they don’t shed (they don’t! ), have sweet, gentile personalities that get along well with other pets (so far, so good), and are hypoallergenic (I don’t believe for one second a living animal can be truly hypoallergenic–they aren’t tubes of mascara–but I figured what the hell). She looks like she’s made herself right at home. Magnolia & Buttercup….sounds like they will be a winning combination. Not sure about the cavachon, but my sister is seriously allergic to dogs and got a border terrier because they are also supposedly hypoallergenic. Lo and behold, she has zero allergies around Lola and plenty of allergies around other dogs. There seems to be something to it! So happy for you all — she looks like she is fitting in nicely!! 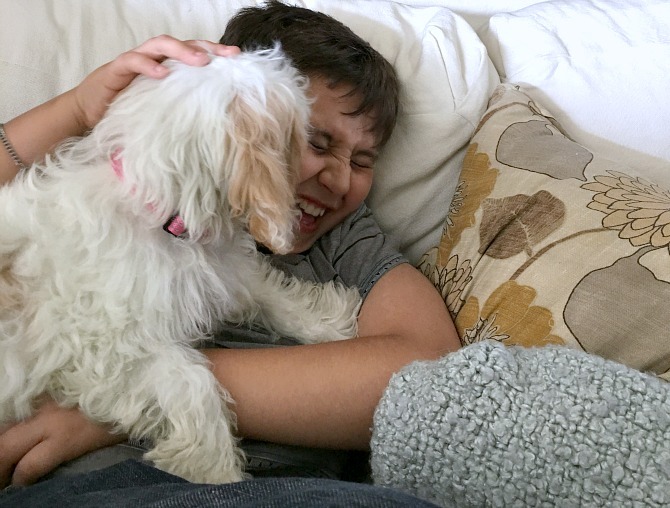 My 6 year old talks about getting a dog all.the.time — and when I say that weneed to get a girl dog, because mommy needs another girl in the house….he cries!!! LOL! What a doll! Looks like she is bringing joy to your lives. Funnily enough, I am all for naming dogs after flowers; my last dog was Violet, my parents’ dog was Sweet Pea, and for my next dog – who knows, will have to see what she looks like – Petunia, Marigold, …. hoping we have a canine addition some time this year. Congratulations! Puppies are a lot of work but so much fun. And it looks like she’s a snuggler which is the best! Is she the kind of dog that needs to be groomed often? Most non-shedding dogs do. A home is just *better* with a dog and Maggie looks like a sweetheart. Congrats. Our Molly carries around Abram’s dirty socks like they are frankincense and myrrh and she’s on her way to see the Christ child. Just Abram’s though. And if there aren’t any on the floor she’ll dig some out of the laundry basket. Weirdo. Abram now blames her for any of his stray socks around the house (he’s smart like that). Mrs. Kendall, can I come over to play? A dog that seriously stinkin’ cute can get away with chewing a few socks, can’t she. Congrats on the new addition. Isn’t it amazing how much a puppy can feel like a new baby? Yeayyyyyyyyyyyy!!! A dog at home is the best. Aww she’s so cute! Where did you get her from? And it’s probably best you’ve yet to introduce Buttercup . . . because then there would be pictures . . . and the cute factor may very well blow our heads to the moon. Best to break us in slowly.